GF Ontario Blog: Book Review and Giveaway! I have been admiring The Baking Beauties for well over a year now. Jeanine (the owner) even has a quickly growing Facebook Fan Page. I have spent countless hours drooling over pictures of her creations. 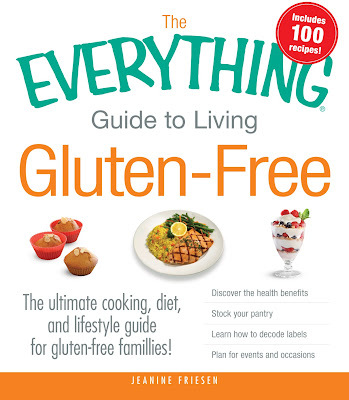 Now she has her very own book called The Everything Guide to Living Gluten Free. If you are new to the gluten-free lifestyle, this book is a must have. Heck, even if you are a Celiac veteran this would be a welcome addition to your cookbook collection. Plus, you will learn facts about gluten and Celiac Disease that you never knew before. The book starts out with tips on how to go about starting your gluten-free diet. Every topic you can imagine is covered here -how to stock your gluten-free kitchen, dining out, hidden sources of gluten, how to handle social gatherings and so on. The second half of the book features 100 recipes. All of the recipes sound delightful - slow cooker Spicy Vegetarian Chili, Twice Baked Greek Potatoes, Lemon Poppyseed Muffins, Strawberry Mango Salsa, Cream Puffs, Pina Colada Parfait (I could go on) and for you meat-eaters out there, Sloppy Joes, Baked Chicken Fingers and Meatballs. Do you want your own copy of Jeanine's book?! Or you can win one below! You can get a total of seven entries ;) So get to it! Thank you Jax for all your good info about GF! !